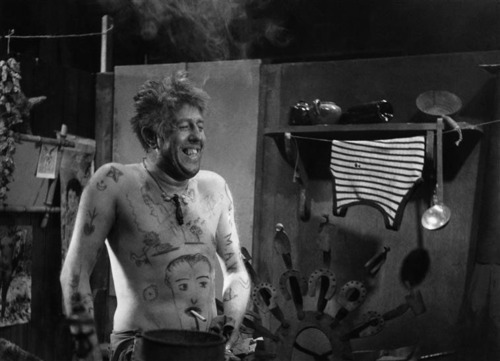 In honor of Valentine’s Day, today’s post concerns one of my favorite cinematic love stories – Jean Vigo’s L’atalante from 1934. Jean Vigo was the James Dean of movie directors: he lived fast, he died young (of tuberculosis at 29), and he left – if not a beautiful corpse – then at least a beautiful body of work. This includes three short films (A Propos de Nice, Taris – Roi de l’eau and Zero de Conduite) and one feature, L’atalante. All of this work was done in a span of just five years, from 1929 to 1934, and constitutes a total running time of less than three hours. Yet Vigo’s status as a cinematic immortal is ensured – in large part due to L’atalante, one of the most ecstatic hymns to romantic love ever to grace the silver screen. L’atalante opens with the marriage of a young couple in a provincial French town: Jean (Jean Daste) is the well-traveled captain of the barge L’atalante, Juliette (Dita Parlo) is a naïve young woman who has always lived with her parents and knows nothing of the world outside of their hometown. Since the couple has barely had the chance to get acquainted, their relationship will be tested as they travel down the Seine river from Le Havre to Paris on an expedient honeymoon/cargo delivery trip. The other central character in this romantic drama is the most unforgettable – Pere Jules (character actor Michel Simon in a legendary performance), an eccentric, heavily tattooed, cat-loving first mate, whose conversations with Juliette provoke the first tensions in the newlyweds’ marriage. This foreshadows the more serious rift that will occur when the barge arrives in Paris and Juliette runs off, seduced by the City of Light. L’atalante is often considered a work of “Poetic Realism,” a loosely defined movement of French films from the 1930s that took the poetic innovations of avant-garde movements such as Surrealism and Impressionism and wedded them to the conventions of narrative continuity filmmaking (the “invisible” style of Hollywood), thereby making them more accessible to mainstream audiences. The key filmmakers of Poetic Realism include Jean Renoir, Marcel Carne and Julien Duvivier. But even among this esteemed company, Vigo was a man apart, a visual poet who attempted to stuff his movies with as many rhapsodic and lyrical passages as possible. Examples of some of the intoxicating imagery from L’atalante: early in the film, Juliette tells Jean she had seen a vision of him before they ever met by plunging her face into water – thus knowing he would be her “true love.” After she runs away, Jean falls into despair. But mindful of her story, he jumps into a canal and, in a series of sumptuously photographed underwater images, sees Juliette in her wedding dress superimposed everywhere around him. Later, Juliette and Jean spend their first night as a married couple apart. As they lie in separate beds in different parts of town, Vigo makes us feel their painful romantic longing by intercutting between overhead shots of the two of them. Not only is the framing and positioning of the actors similar in each shot, Vigo boldly lights both locations in a similarly stylized way: a mirrorball effect with tiny dots of shadow falling on each character. Then, in an exquisite series of shots, Jean and Juliette begin to slowly kiss and caress their own bodies, their movements eroticized by Vigo’s use of dissolves and slow motion cinematography. Once seen, the sadness of this separated couple will never be forgotten. Because of the painful nature of their conflict, which is predicated on Jean’s jealousy and quick temper, their eventual reunion is made all the sweeter. Fittingly, it is Jules who finds Juliette and leads her back to the barge. When she and Jean see each other, they embrace so passionately that they collapse together on the floor. It is our final image of them before Vigo cuts to an overhead shot of L’atalante sailing down the mighty, eternally flowing Seine. This sublime juxtaposition, which occurs as Maurice Jaubert’s memorable, poignant score reaches a crescendo on the soundtrack, is worthy of Frank Borzage in its suggestion of love as a transcendental force. Much of the credit for the film’s intense beauty belongs to Boris Kaufman, the talented Russian cinematographer who was also the brother of Dziga-Vertov and Mikhail Kaufman (creators of Man with the Movie Camera). Boris went on to an illustrious career in Hollywood, eventually winning an Oscar for his work on On the Waterfront in 1954. But he always retained a special place in his heart for the work he did with Jean Vigo, going so far as to describe their relationship as “cinematic paradise.” This is a phrase that could apply not only to what went on behind the camera but to what they managed to capture in front of it as well. The only Region 1 DVD of L’atalante was released by New Yorker Video in 2003 and is now out of print. It is rumored that the film will be released in new Blu-ray and DVD editions by the Criterion Collection later this year.